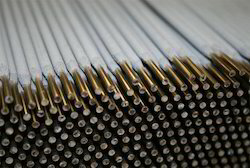 We are a leading Manufacturer of welding electrodes from New Delhi, India. We are involved in providing Welding Electrodes, which are manufactured by our vendors highly skilled professionals, who have wide industry experience and knowledge. These products are manufactured using optimum quality basic material with the help of advanced technology and machines in adherence to the set industrial norms. The offered electrodes are available in various options as per the need of our valuable clients. Moreover, the products offered by us are delivered on stipulate time frame.